After a seven month renovation, it feels so good to finally see this space come to life. 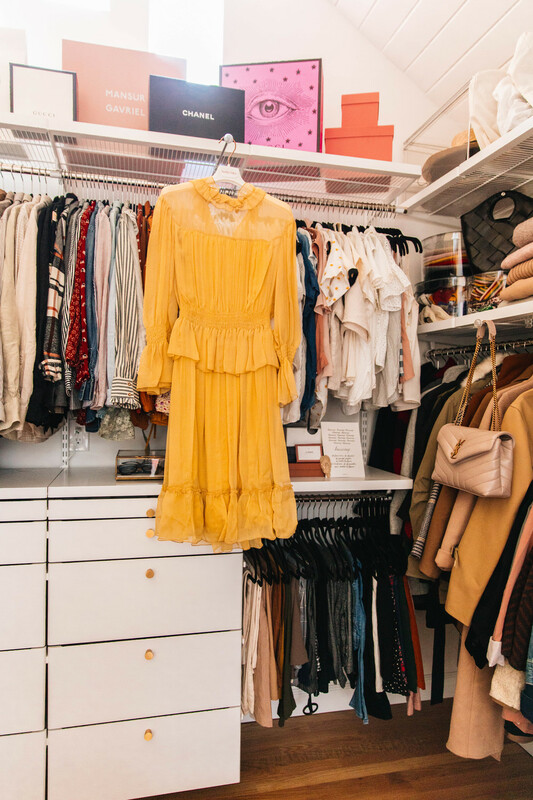 The master closet build out was what essentially snowballed this whole renovation process in the first place. When we first moved in to our 1930's Tudor, we fell in love with its charm. 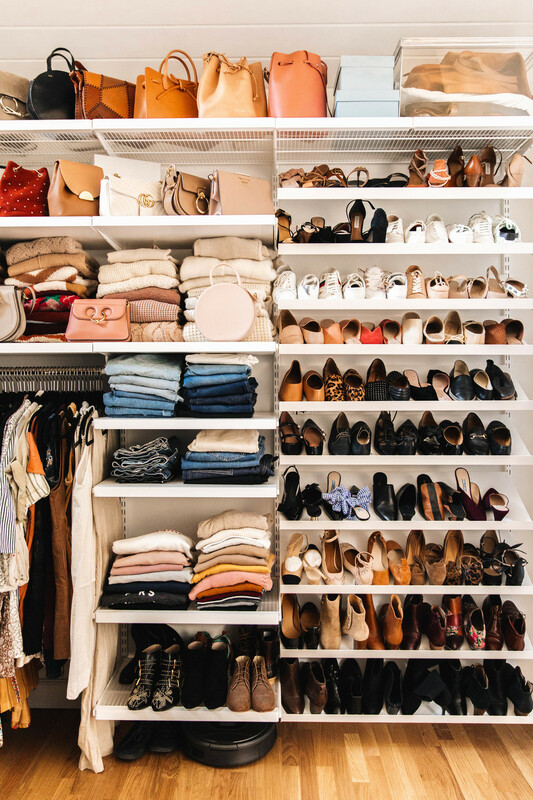 But as time went on, we realized the two small coat closets in our master bedroom just weren't going to cut it. Looking back, it was comical to think we could fit everything in there. The house had other storage options, but having everything scattered across so many different locations quickly became confusing and messy. Thankfully, we teamed up with The Container Store to organize our new space! 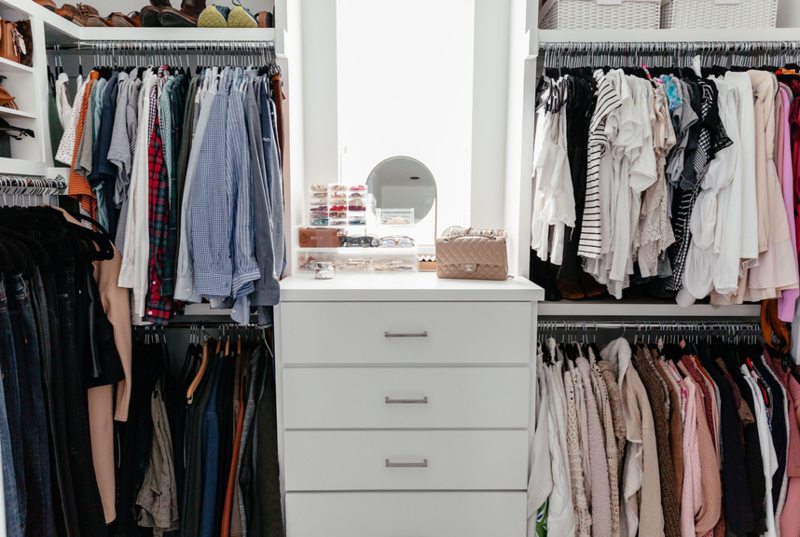 We designed the whole closet with the Elfa System exclusive to the Container Store. 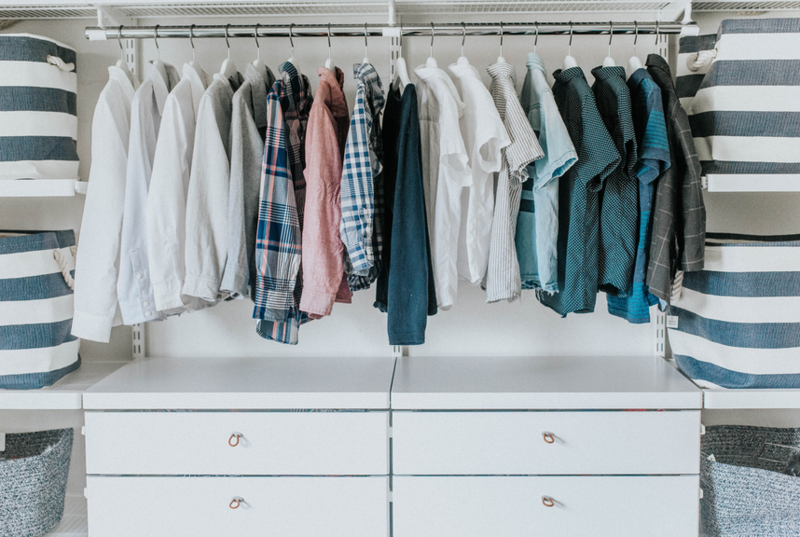 It's completely customizable; closet shelves, drawers and clothing rods can all be adjusted, so if you ever want to change anything or find yourself needing more room for folded items vs hanging, it's easy to move things around. We met with one of their designers at their Scottsdale store for a free design consultation. The whole process is really easy. Oh, and did I mention Elfa is 30% off until February 26th? 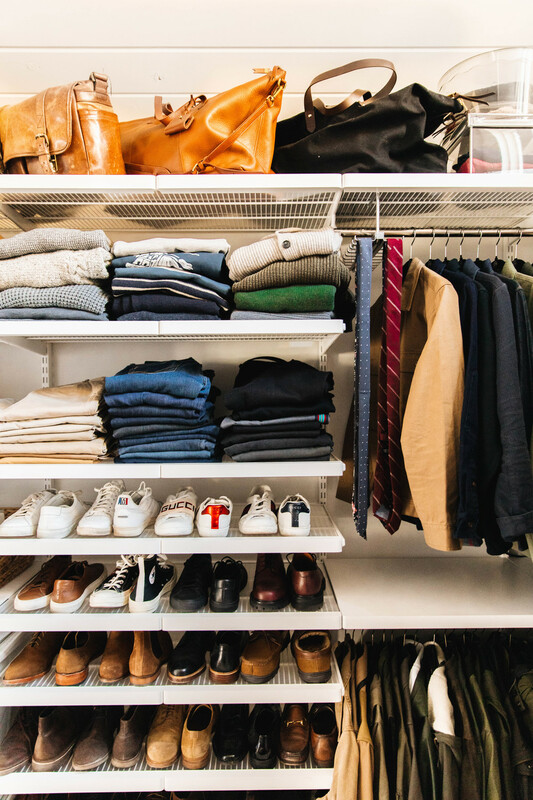 First, we divided the closet into his and her sections to keep things tidy. Here's a look at my section first. We put a wall of shoe shelves on the right side. 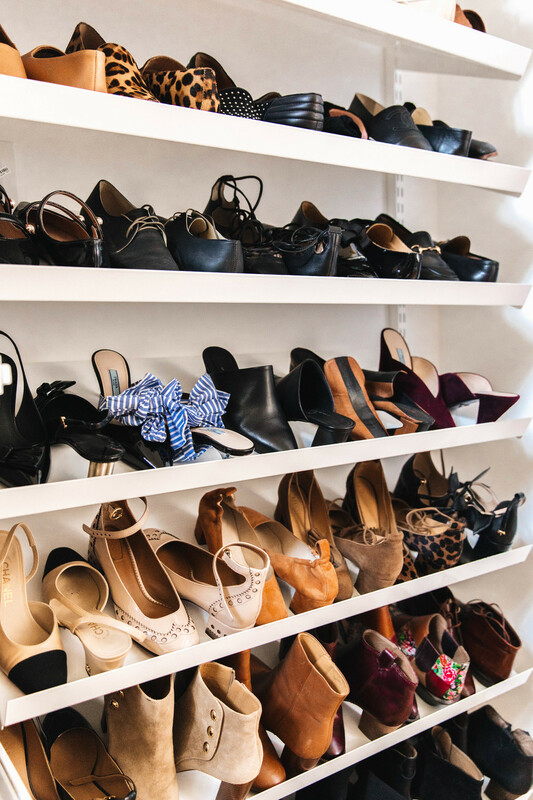 I absolutely love the angled solid metal shoe shelves for optimizing our space. This also keeps my collection visible and accessible. I still can't believe how much we were able to fit in the space. Jeans and shorts were organized by cut and fit, which we then separated into stacks on shelves. 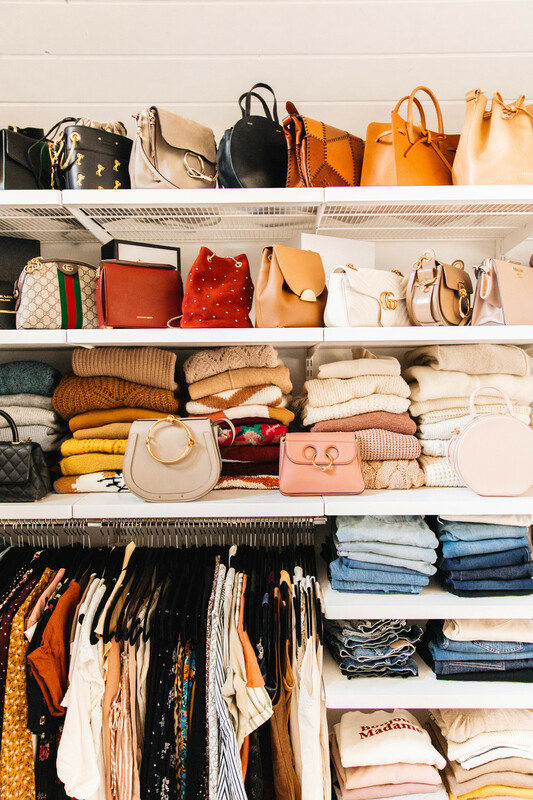 Above that, I color coded all of my sweaters, and organized my purses for easy access. Hanging clothing was organized by length and type. The main wall in the space houses all my blouses as well as Rob's button-down shirts. 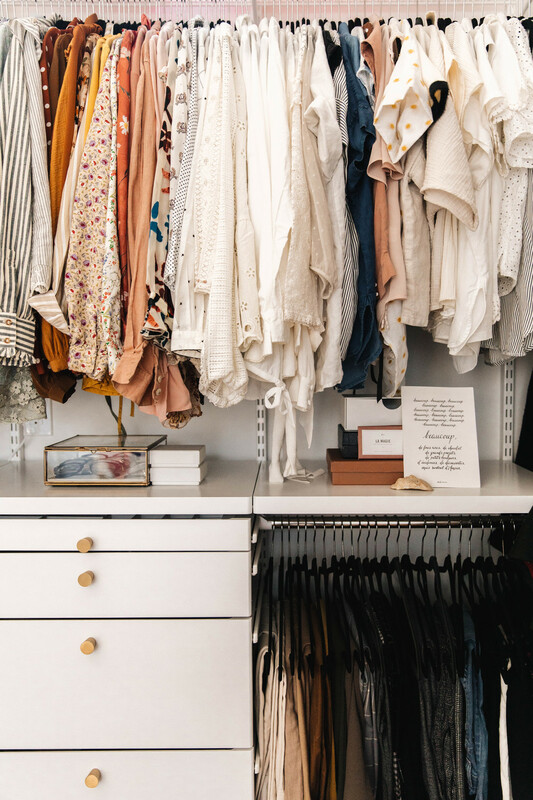 Everything is sorted by sleeve length and color, which makes keeping the closet tidy so much easier. Below are Rob's blazers and suits, and my pants and shorter skirts. 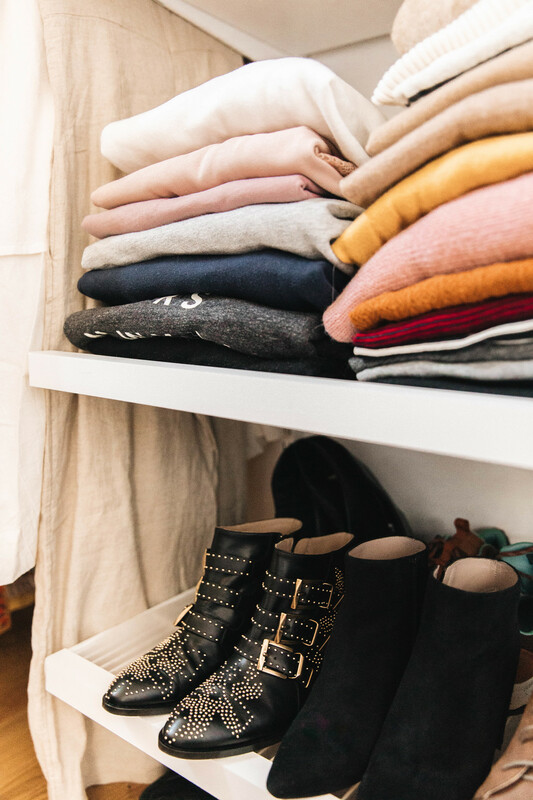 I think one of our favorite parts has to be the built-in dresser. We store workout clothes, pajamas, and t-shirts in the bigger drawers. 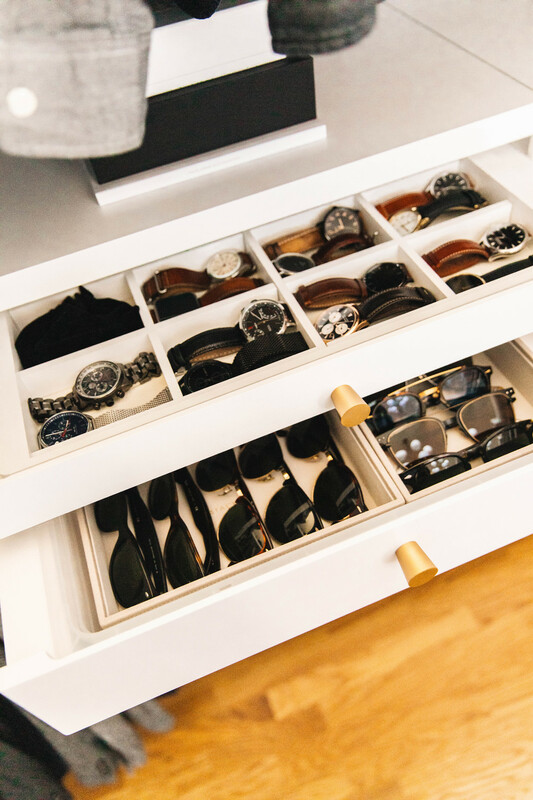 The top drawers are dedicated to jewelry, sunglasses, belts, etc. 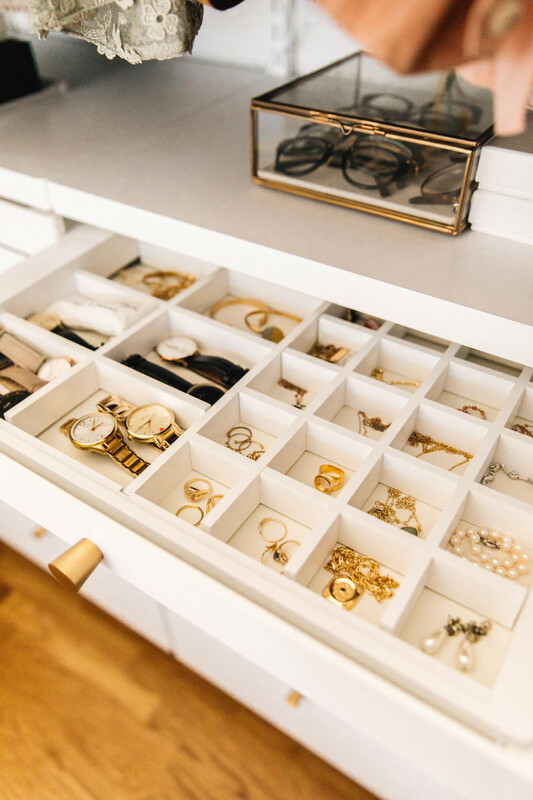 The Elfa jewelry trays made it simple for Rob and I to keep watches and small jewelry pieces organized. I love having everything in one place and seeing it all neat and tidy. Rob's side of the closet is on the left. 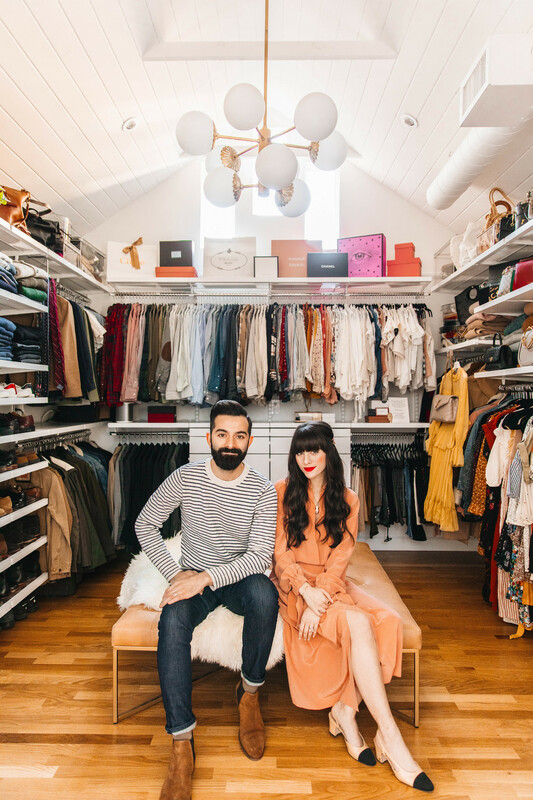 The top shelf is dedicated to totes, camera bags and backpacks. We stacked Clear Lookers Boxes and hat boxes to organize beanies, bathing suits, and off-season items like scarves and a few of my shawls. 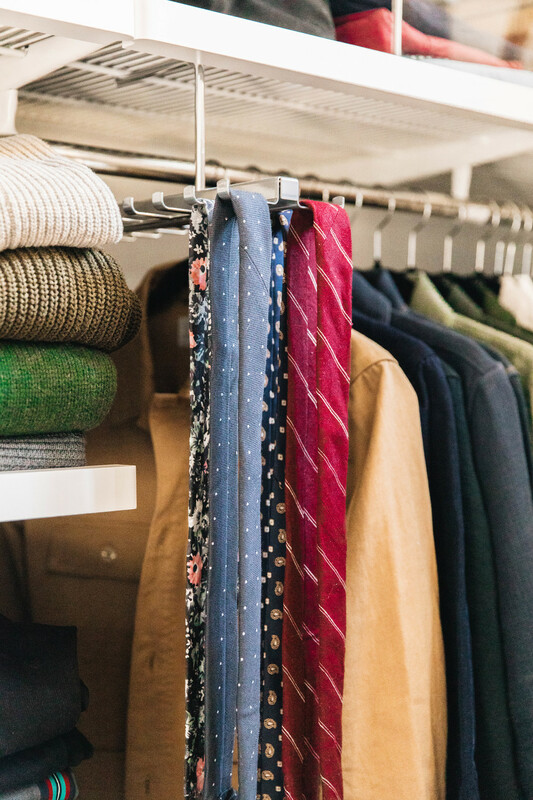 To the right, are coats and jackets. Little add-ons, like the gliding tie rack and valet rods have made storing items, as well as planning and displaying outfits, so nice. The little details like this get me. You can also spot even more hat boxes in the photo above; the small one is perfect for scarves and bandannas, berets fit easily in the medium one, and I put bathing suits in the larger one. 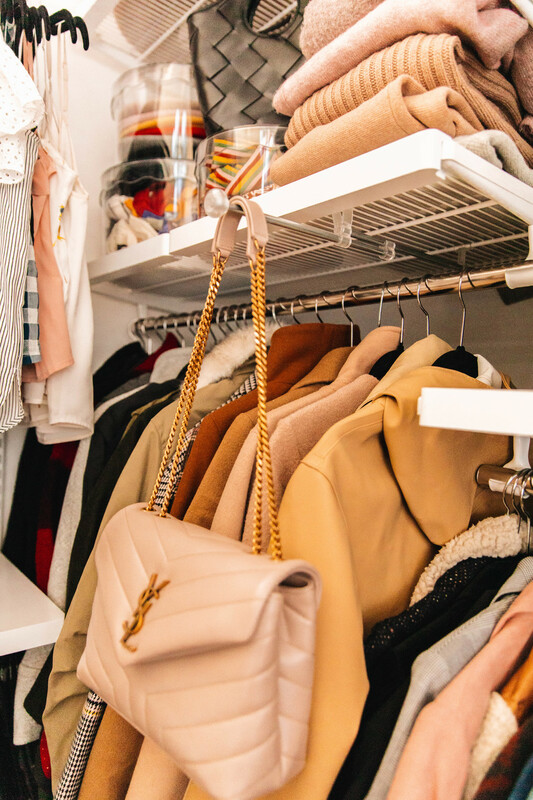 Adding laundry in our master closet was a big deal to us. 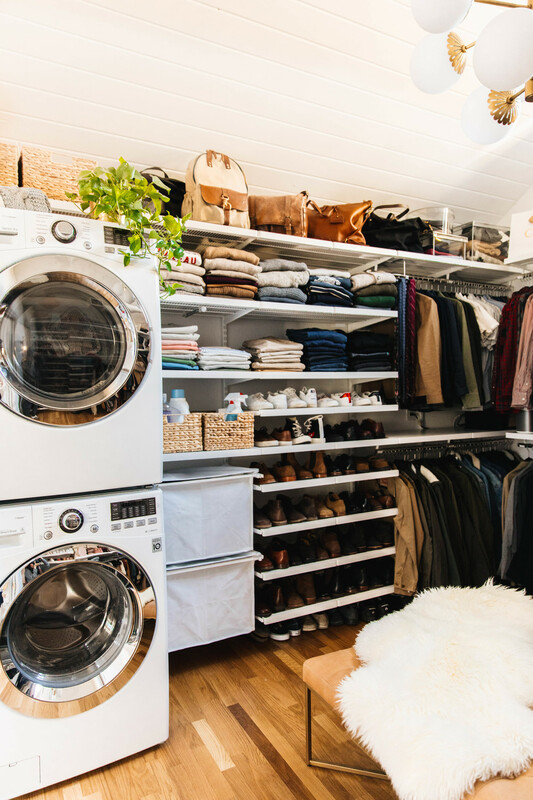 We installed the Elfa hamper system right next to the washer and dryer, along with some of their wicker baskets to keep laundry detergent and dryer sheets all together. The completed master closet now measures 12 x 13 ft. which was nearly the size of our old bedroom. Kind of crazy, right!? The closet is now also home to our cleaning materials, ironing board and small vacuum. We even hid our modem in here, too. And that's a wrap! 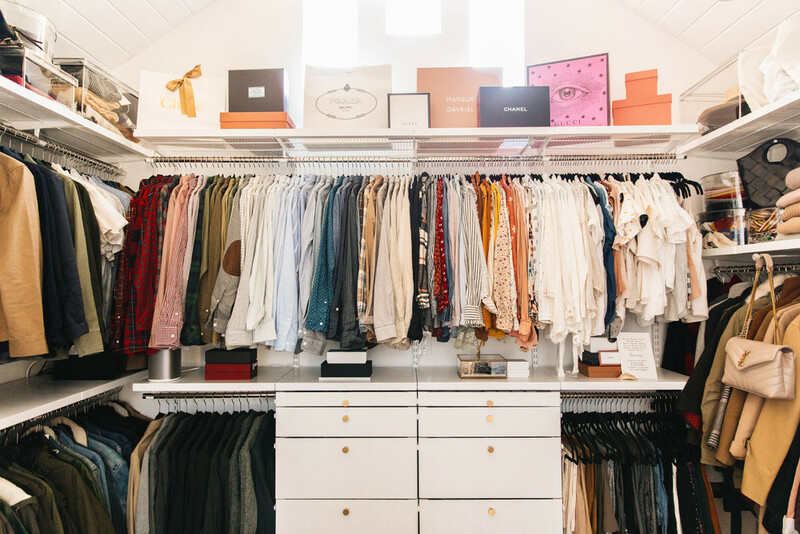 It's been so much fun seeing this space come to life, and we couldn't be happier with the results and all the added storage - especially with our new baby coming in the summer. Be sure to head to our Blog to see more of our home! Don't forget to check us on Instagram, too.